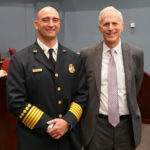 Arlington County, VA. – The Arlington County Fire Department wants to help you make your home safer from fire. 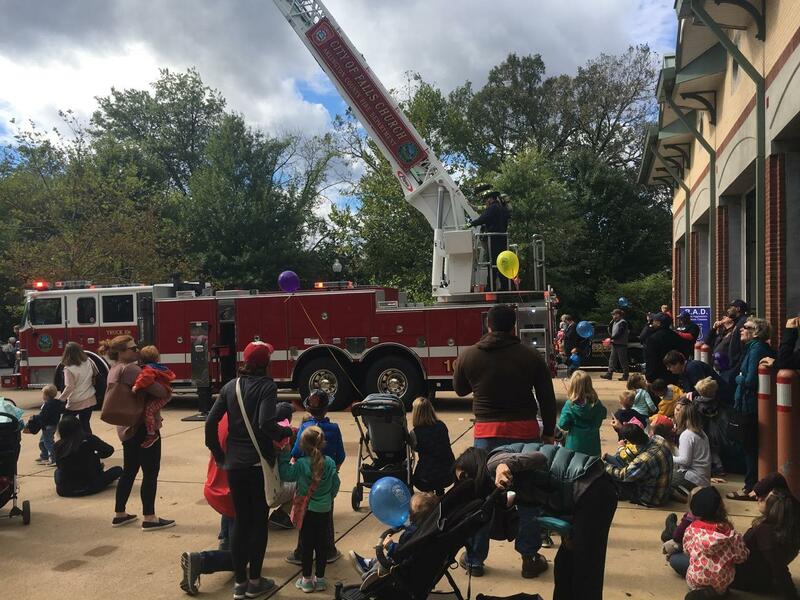 Beginning Saturday, April 6, 2019 and continuing through Saturday, October 5, 2019, Arlington County firefighters will be going door to door offering home safety checks to include inspecting smoke and CO alarms and giving relevant fire safety tips. For homes not protected by smoke alarms, firefighters will install working smoke alarms free of charge. 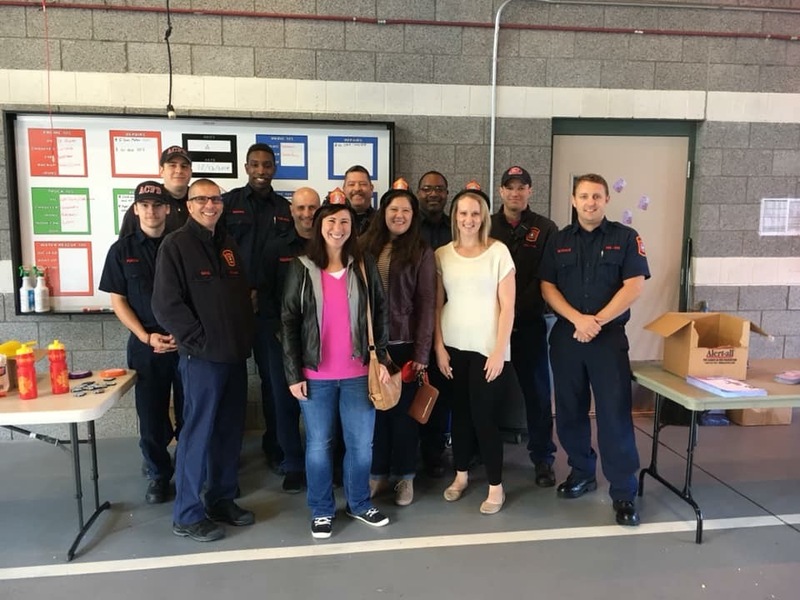 Last year Arlington County firefighters visited 4,4439 homes, installed 203 free smoke alarms and replaced 221 alarm batteries. For additional information on Operation Fire Safe and to request a home safety check, https://fire.arlingtonva.us/safety/operation-fire-safe/ . 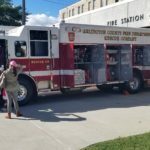 Follow ACFD on social media: @ArlingtonVaFD. 1/25/19 – Asbestos abatement has been underway this week and should be completed today. Next week, the general contractor should be in station to begin cutting walls and the apparatus bay slab to allow further structural inspection. Once that is done, and the structural engineer is able to verify the condition of the walls and slab, appropriate repairs will be determined and hopefully started soon after. 11/27/18 – A comprehensive structural study is going to be conducted on Station 7. It is expected to last 4-6 months. No work will begin util after that study is done. 10/30/18 – Today, Engine 107 will officially begin the temporary relocation as they move up to Station #4 in Clarendon. This move will precipitate the further moves of Rescue 104 from Station #4 to Station #3 in Cherrydale and Fire Marshal 113 from Station #3 to Station 8 in Halls Hill. 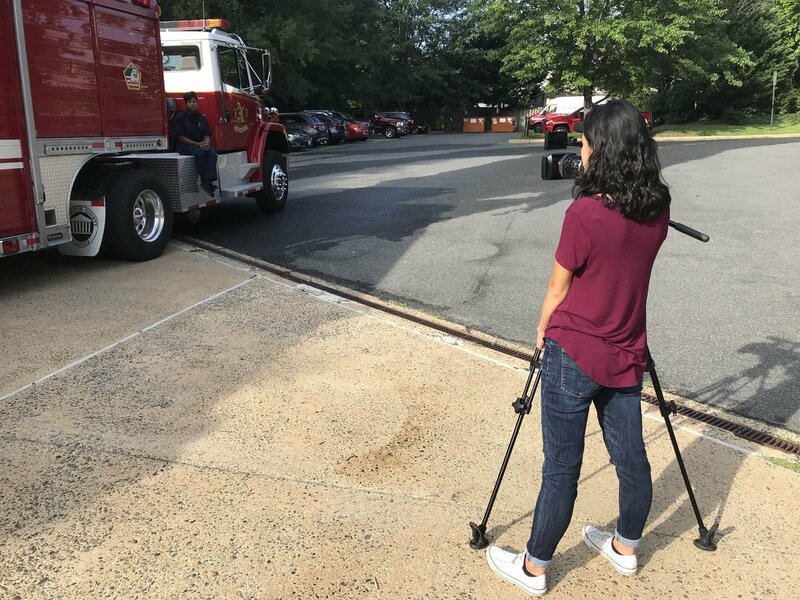 These moves were done to keep the Engine 107 in a temperature-controlled environment while creating the least impact possible on service across the county. 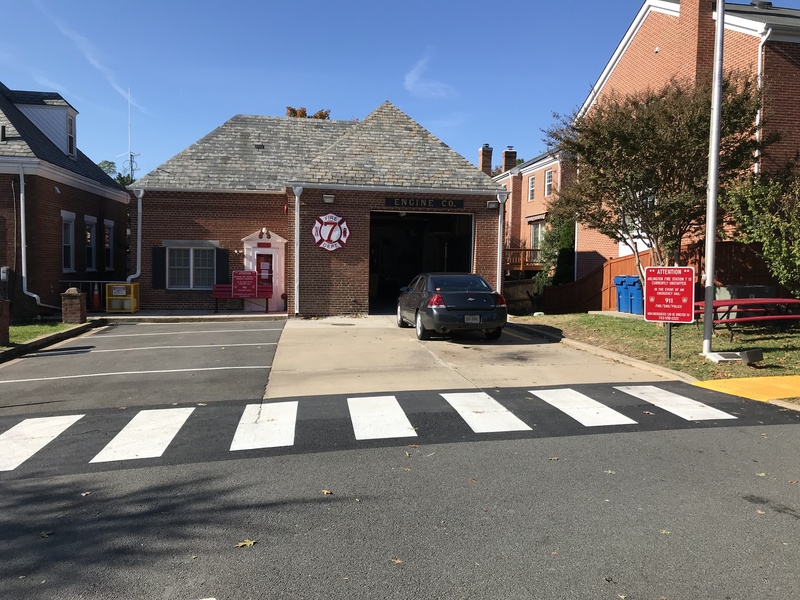 These unit moves will remain in effect until engineers can figure out the options and ACFD and the Department of Environmental Services identify a plan moving forward for Fire Station #7. Engineers are researching possible fixes, but this will require a more thorough inspection of the concrete slab. That cannot be completed for approximately 30-60 days, and it will require the crew to be housed elsewhere while the assessment is completed. Since Engine 107 can no longer be kept in the apparatus bay, ￼the crew is forced to keep it outside. 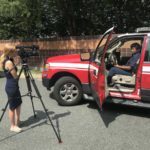 Dropping temperatures create freezing issues for the water stored in the truck for fire suppression and the medications that are kept on it for Emergency Medical Services. 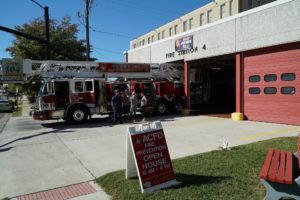 The need to keep the apparatus in a temperature-controlled environment requires ACFD to move Engine 107 to another fire station until engineers can figure out the options and ACFD and the Department of Environmental Services identify a plan for Fire Station #7. 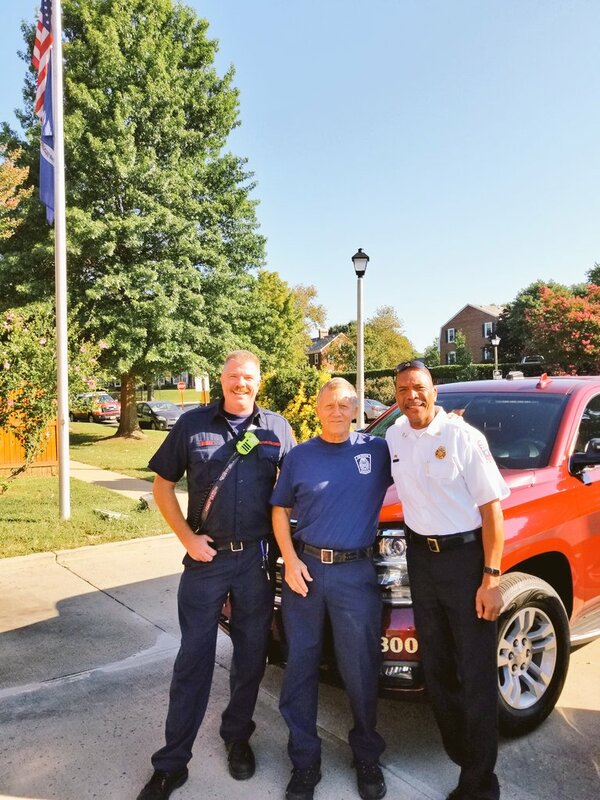 On October 30, 2018, Engine 107 will move to Station #4 in Clarendon, Rescue 104 will move to Station #3 in Cherrydale and Fire Marshal 113 will move to Station 8 on Lee Highway. 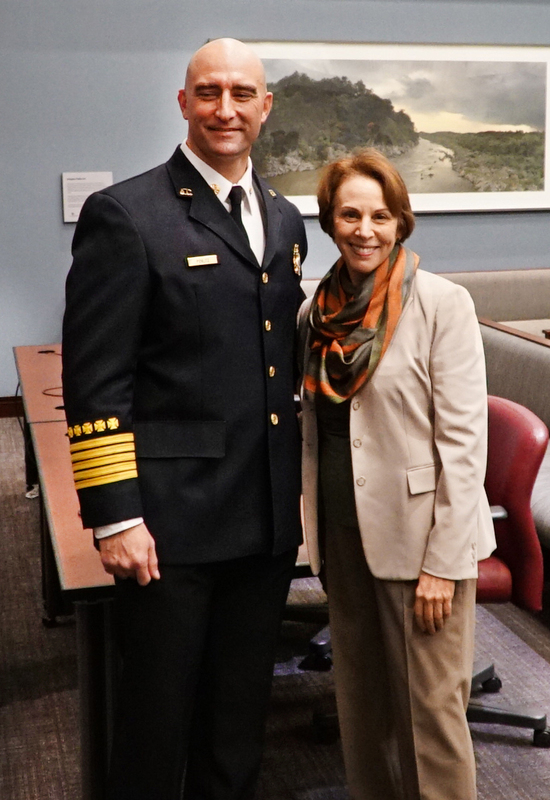 The proximity of Fire Station #9 and our mutual aid agreements with Alexandria and Fairfax County will ensure that Fairlington and Shirlington continue to receive expeditious fire and Emergency Medical Services. 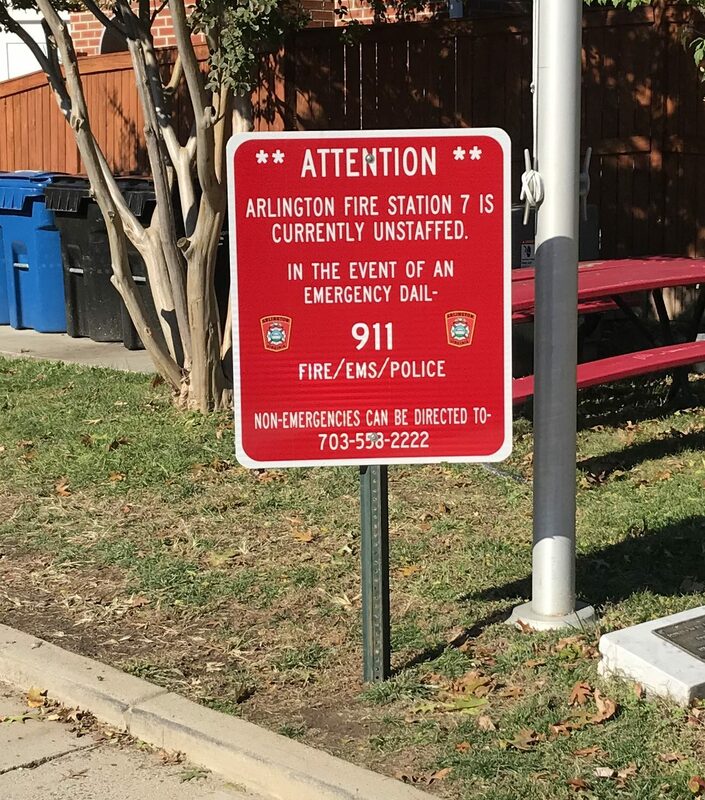 While there may be a slight increase in response times to residences right around Station 7, most areas of Fairlington will maintain similar response times to those seen with Engine 107 responding from Station #7. 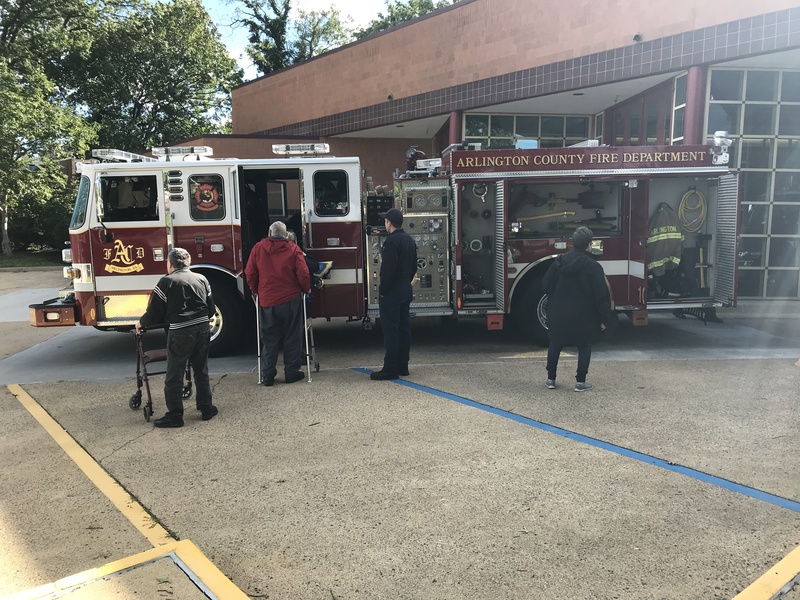 Arlington County Fire Department is committed to providing the same level of professional services to Fairlington, Shirlington and the surrounding neighborhoods while we work through the issues with Fire Station #7. 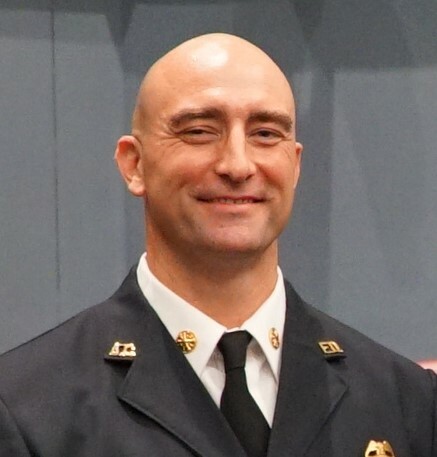 Fire Department representatives will be meeting with neighborhood associations to address any questions or concerns, and they will be keeping the community informed as the situation is updated. We will also update this web page as new information becomes available. 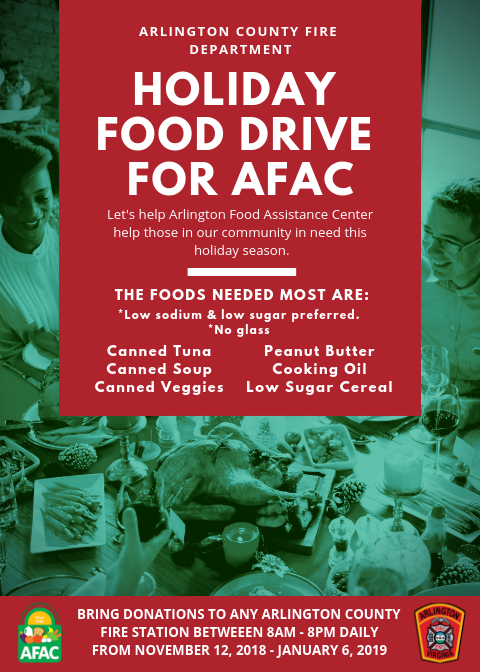 November 9, 2018 – Arlington County Fire Department is asking for the public’s assistance in collecting food for the Arlington County Food Assistance Center (AFAC) this holiday season. 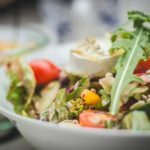 According to a recent study conducted by Virginia Tech, more than 31,500 Arlingtonians describe themselves as food insecure (having limited or uncertain access to food, reduced food intake, and disrupted eating patterns). 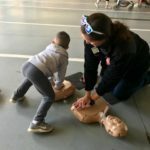 Over 12,000 of these individuals are currently being served by AFAC. Of those individuals served, over one third of them are children. Last year, AFAC distributed over 4 million pounds of food to families in need. 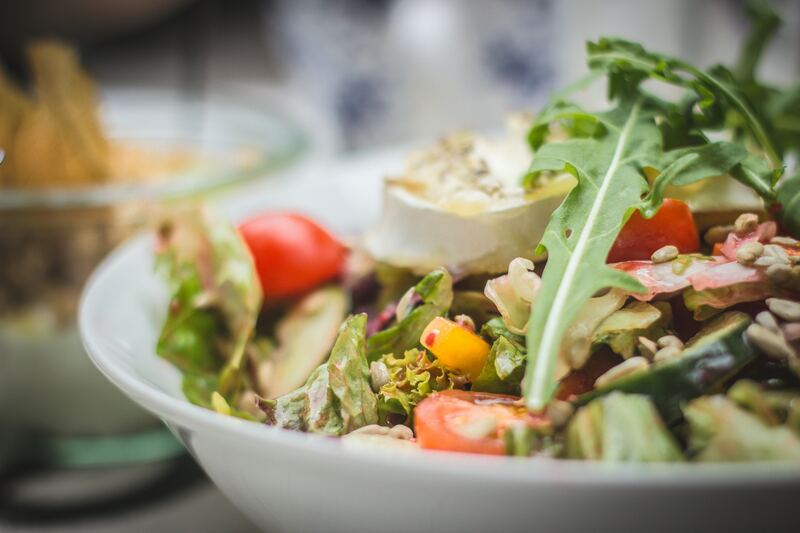 Please refrain from donating foods that are opened, expired, prepared meals, or packaged in glass. 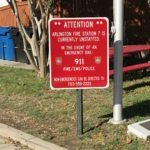 All 10 Arlington County Fire Stations have a collection box for food donations. Stations 2, 3, 5, 6, and 9 will have boxes in their public lobbies that are accessible any time of the day or night. Station 7 will have a donation box outside the station that you can also access any time day or night. For stations 1, 4, 8 and 10, please stop by any time between 8 am and 8 pm to drop off your donations. 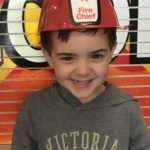 Just ring the doorbell and firefighters will collect your donations. 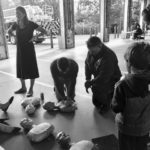 (find the station closest to you) Donations will be delivered to AFAC November 20th, December 19th and January 7th at the conclusion of the drive. 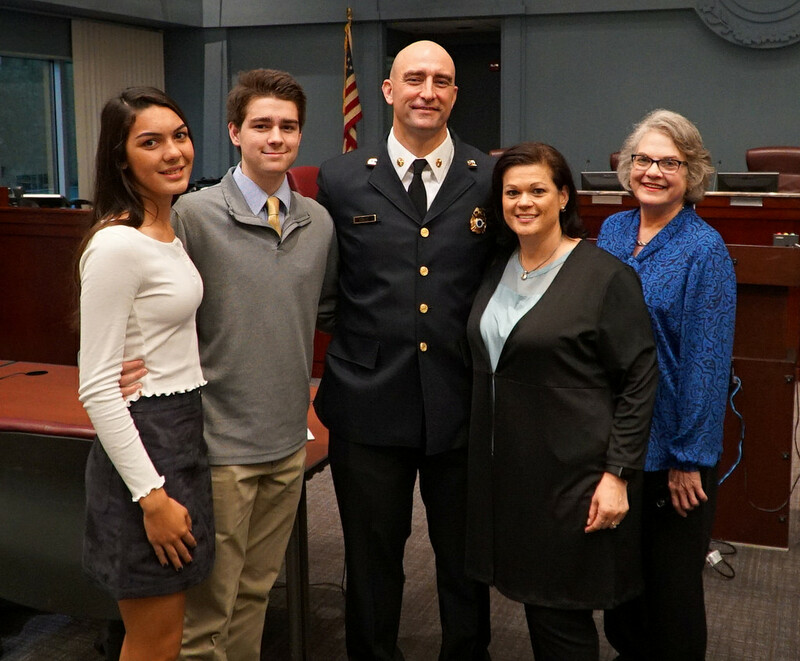 November 5, 2018 – In a ceremony held Monday morning in the County Board Room, David Povlitz was sworn in as the new Arlington County Fire Chief. 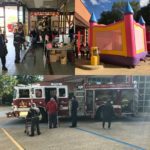 Members of the County Manager’s Office, the County Board, the fire department and other county departments attended the event. 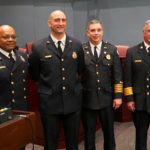 Chief Russel Miller of Joint Base Ft. Myer – Henderson Hall, Chief John Butler of Fairfax County Fire & Rescue and Chief Povlitz’s former boss Chief Robert Dube of the City of Alexandria Fire Department also attended the event. 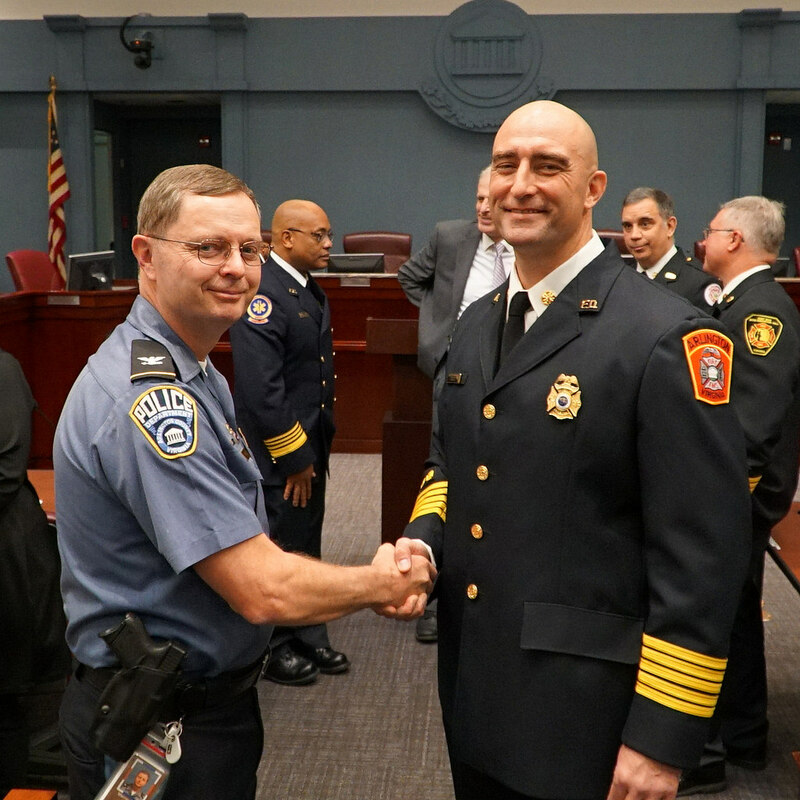 The Arlington County Fire Department Honor Guard presented colors while Firefighter/Paramedic Frank Miller sang the National Anthem. 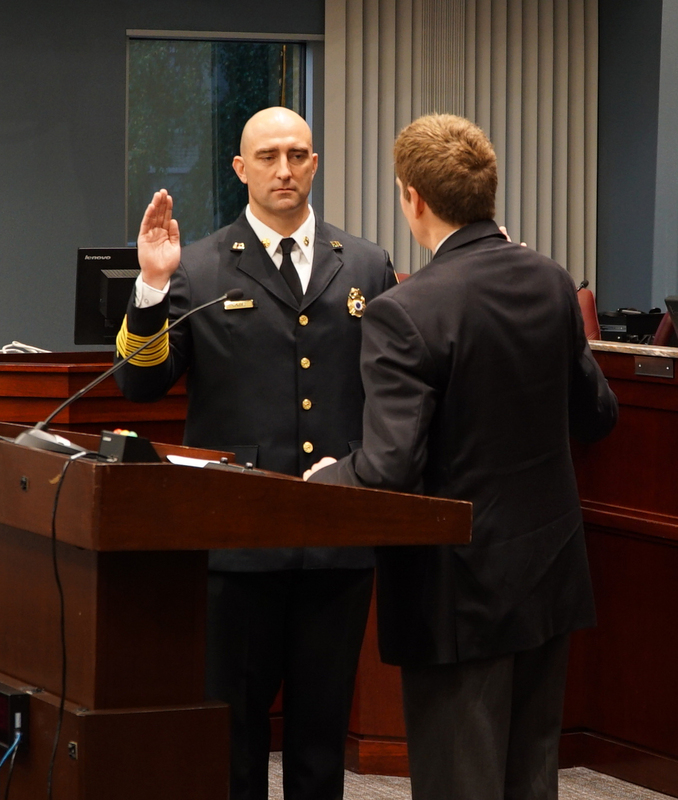 County Manager Mark Schwartz said a few words about selecting Chief Povlitz as the next leader for ACFD. 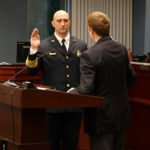 Circuit Court Clerk Paul Ferguson did the actual swearing in of Chief Povlitz. 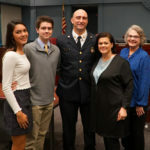 Afterward, Chief Povlitz talked about feeling honored to be selected, and looking forward to serving Arlington County residents. Saturday October 13th, all Arlington County Fire Stations capped off Fire Prevention Week 2018 with our annual Open House events. 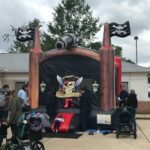 Each station had crowds of community members show up to enjoy the various attractions including bounce houses, popcorn, cotton candy and games. 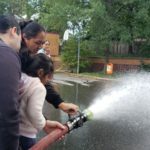 There were also demonstrations, hose lines and of course fire trucks and firefighters. We heard a lot of great questions from visitors, and enjoyed our time interacting. Thank you to everyone who came out to visit us, some more than once, on Saturday. We hope you all enjoyed yourselves as much as we did. 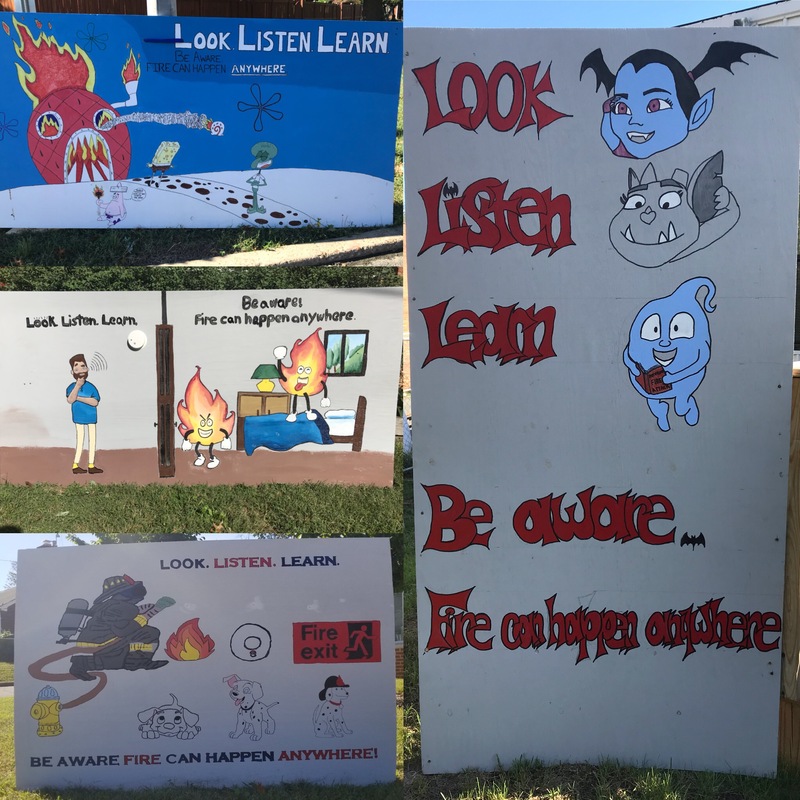 The theme of 2018 Fire Prevention Week “Look. Listen. Learn. Be aware. 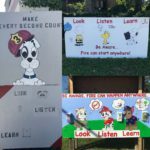 Fire can happen anywhere,” highlights three important actions to keep yourself and your family safe from fire. Look for places fire could start. Take a good look around your home. Identify potential fire hazards and address them. If necessary, have a qualified professional correct any hazards. Listen for the sound of a smoke alarm. A smoke alarm is the most important safety feature of your home. Properly installed, working smoke alarms in your home cuts your risk of dying in a fire in half. Install on every level of your home, including the basement and in every sleeping area. Learn two ways out of every room. 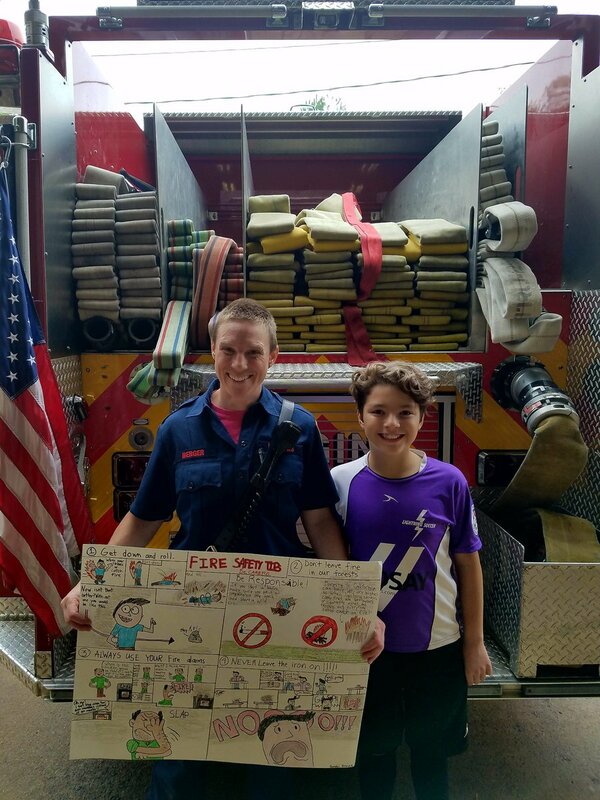 Create and practice a home fire escape plan with everyone in your household. In a typical home fire, you may have as little as one to two minutes to escape safely from the time the smoke alarm sounds. Plan two escape routes from every room, usually a door and a window. We look forward to seeing everyone again next year if not before. 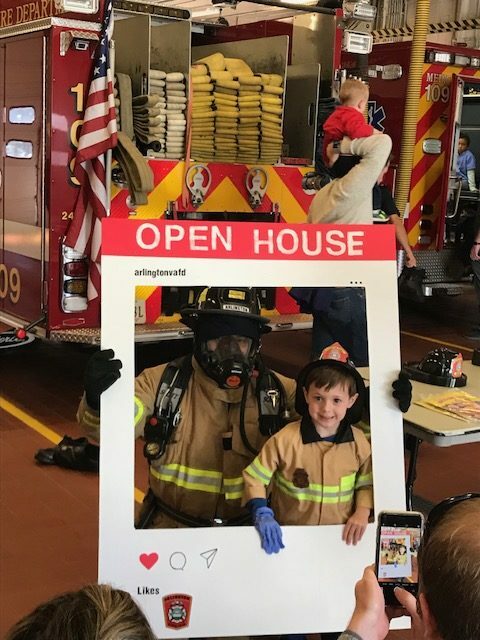 While our Fire Prevention Week Open House is a planned event we hold every year, you are always welcome to stop by during the day or early evening to visit with us. 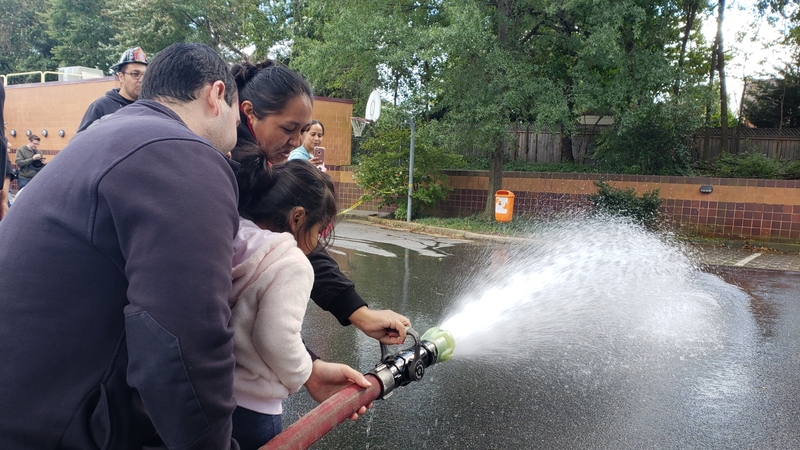 We’re always happy to show the kids the fire trucks and answer any questions you my have. 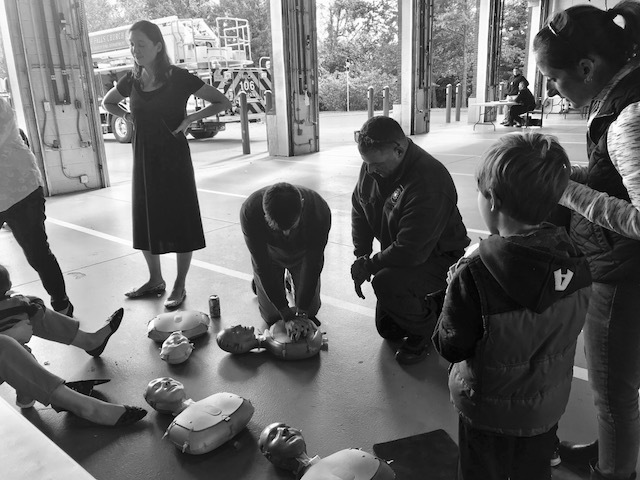 Attendees learn hands-only CPR at Station 6. 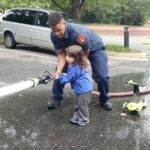 FF/Paramedic Bieber backing up one of the kids on the line. 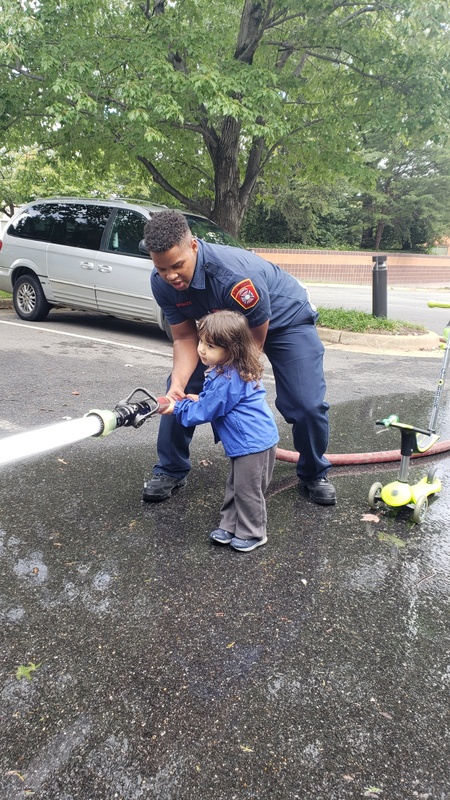 FF/EMT Spencer shows this young firefighter how to make the push. A little Frisbee play at Station 7. 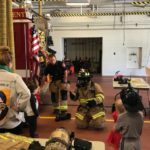 New firefighters tried out the gear at Station 9. Station 6 had a large crowd all day. Group shot at Station 5. 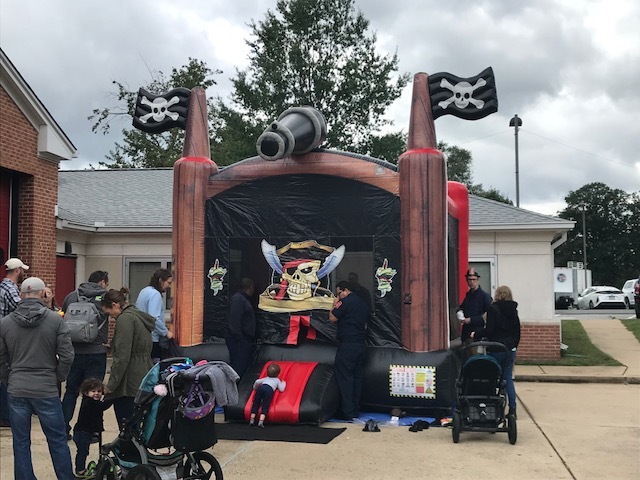 Station 9 was bouncing Pirate style. 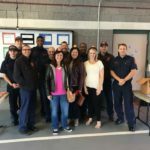 There was a lot to look at for those who visited Station 1. 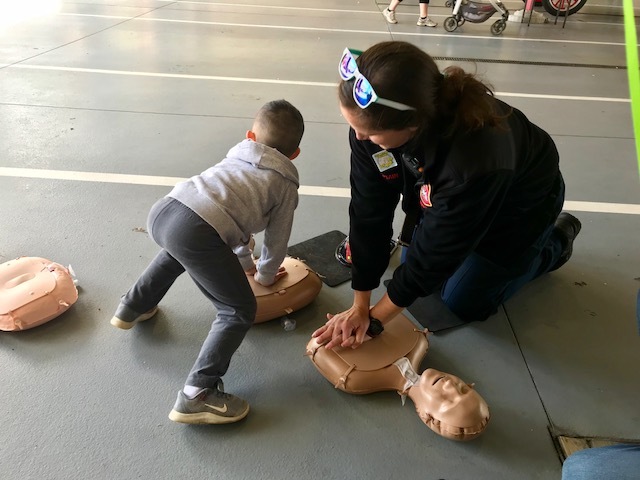 Young EMT learning Hands-only CPR at Station 6. 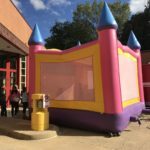 A bounce house fit for a king or queen at Station 1. 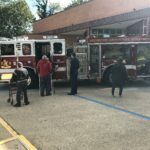 Residents were checking Engine 101 over er inside and out. 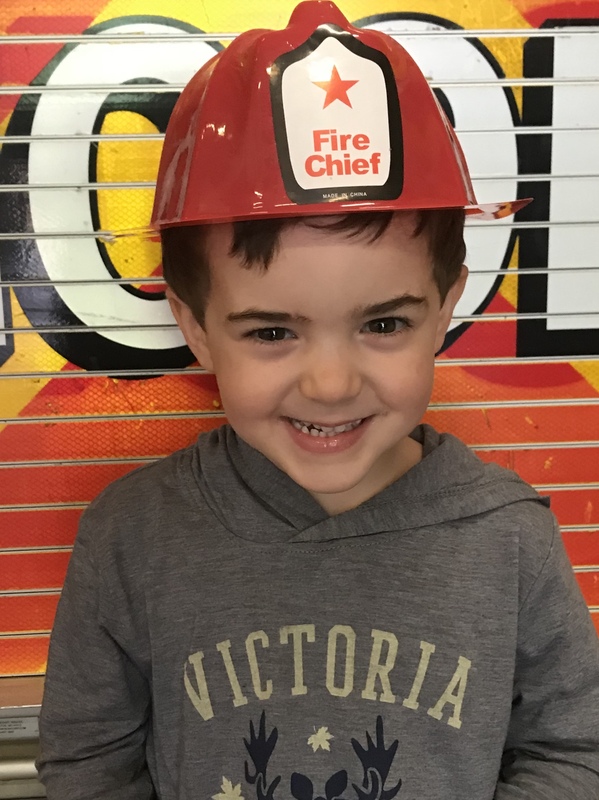 Judging by the smile, the Fire Chief was pleased with what he saw at Station 8. 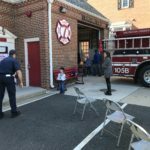 Crew at Station 9 was gearing up kids an taking their ID pictures. 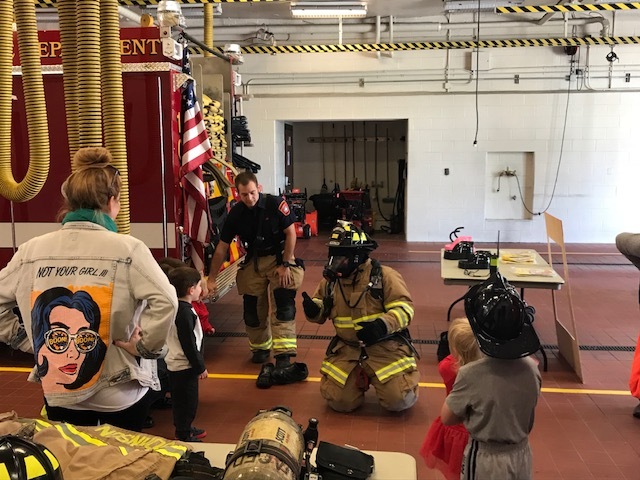 Showing kids we’re not really that scary in our gear. It’s just a firefighter under all that stuff. After an extensive search process, County Manager Mark Schwartz has appointed David Povlitz as Arlington County Fire Chief, effective November 5, 2018. 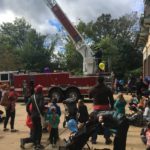 ARLINGTON, VA – Fire Prevention Week is October 7th thru the 13th this year. 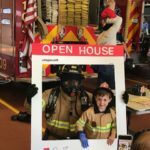 Arlington County Fire Department will host an Open House event on Saturday, October 13, 2018 from 1000 – 1600 hours at all 10 fire stations. All stations will have light refreshments and give away items. 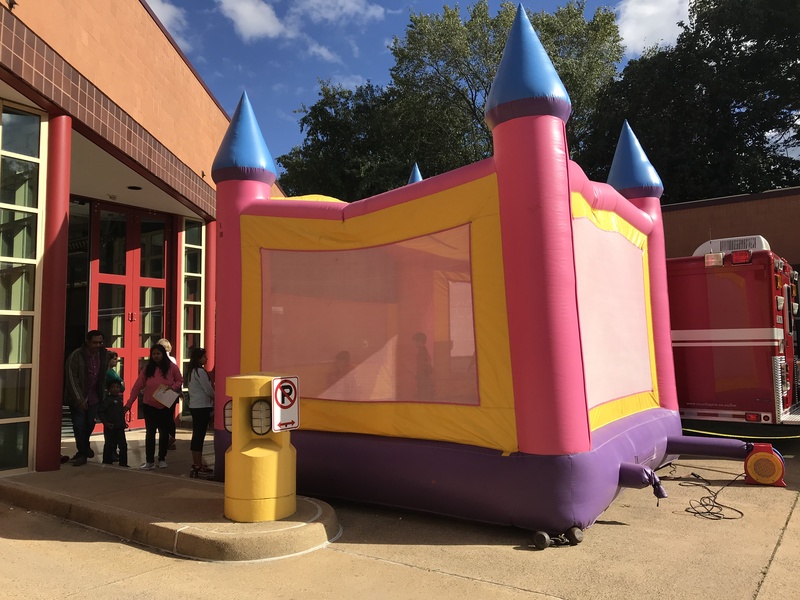 Some stations will have attractions including: popcorn, cotton candy, moon bounce, face painter, costume fire gear for small children and fire safety props. Each station is different, so you’re encouraged to visit more than one station. 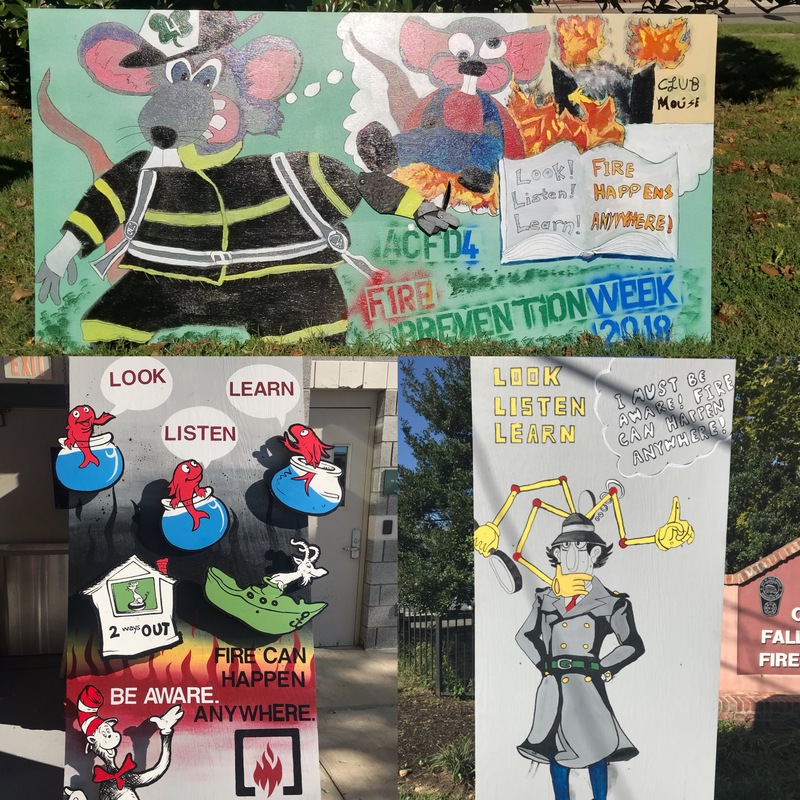 This year’s Fire Prevention Week theme provided by the National Fire Protection Association (NFPA) “LOOK. LISTEN. LEARN. Be aware. 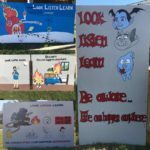 Fire can happen anywhere”, highlights three important actions to keep yourself and your family safe from fire. “LOOK. LISTEN. LEARN. Be aware. Fire can happen anywhere”. Any child in kindergarten through 8th grade is eligible to participate. 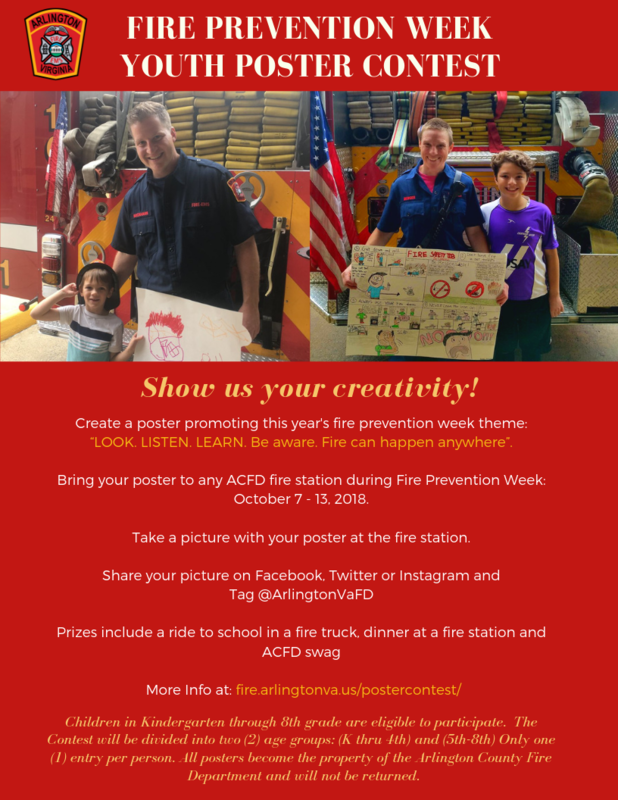 Posters must be delivered to the fire stations by October 12, 2018. Please ensure your poster has the child’s contact information clearly written on the back, including their name, parent’s name, home phone number and email. Posters will not be returned. be awarded a small prize and two grand prize winners will win either a ride to school in a fire truck or dinner at a fire station. “LOOK. LISTEN. LEARN. Be aware. 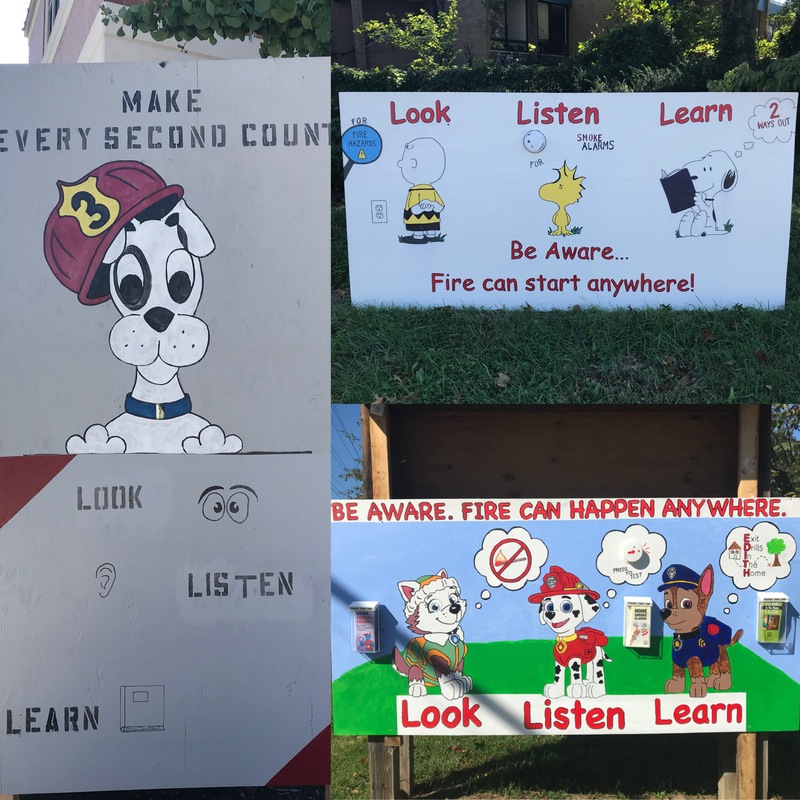 Fire can happen anywhere” and encourage fire safety awareness in the home, school or community. A panel of judges will select the winning posters based on originality, clarity of message, and design. The decision of the judges is final. Maximum size: 22 inches by 28 inches. Kind: Any art medium. Including painted cut-outs, ink, crayons, chalks, pencils, computer graphics, but not limited to these. No objects over one-half inch in thickness are to be placed on the poster. No live matches may be used on the poster. Children in Kindergarten through 8th grade are eligible to participate. The Contest will be divided into two (2) age groups: (K thru 4th) and (5th-8th). 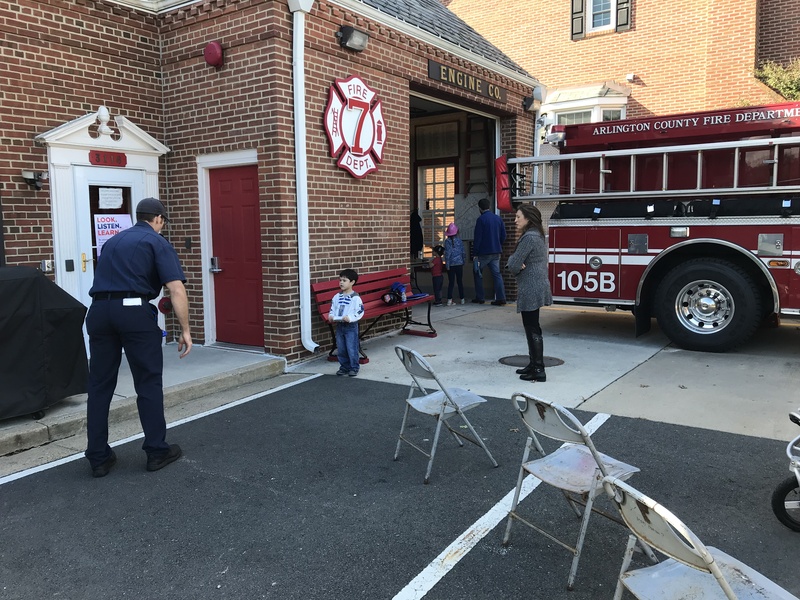 Posters are officially entered when they are delivered to any ACFD fire station and a picture is posted on Facebook, Twitter and/or Instagram tagging @ArlingtonVaFD. All entries must be submitted by October 12, 2018, to be eligible for a prize. 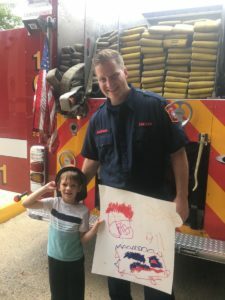 All posters become the property of the Arlington County Fire Department and will not be returned. 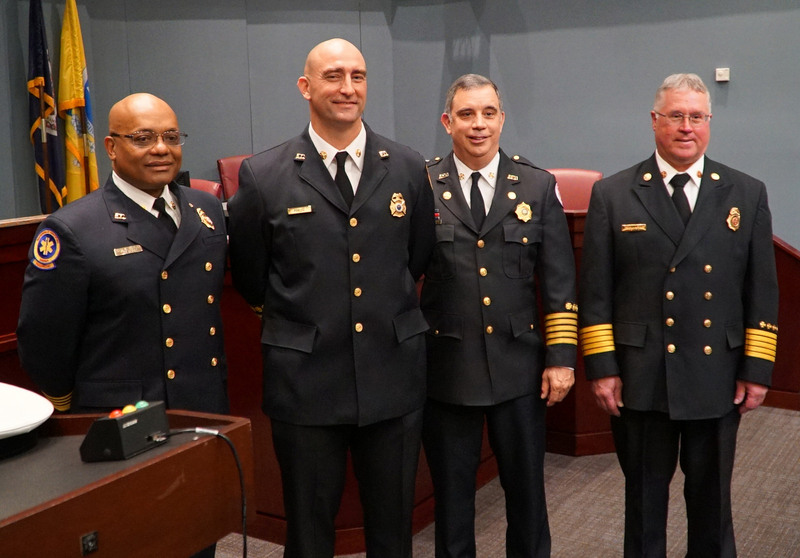 During our last round of promotions, Battalion Chief Tiffanye Wesley became not only the first female African-American Battalion Chief in the Arlington County Fire Department’s history, she also became the first one in Northern Virginia. 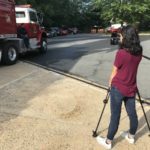 Since taking over her new post, she has done a number of interviews about her journey to her new position. 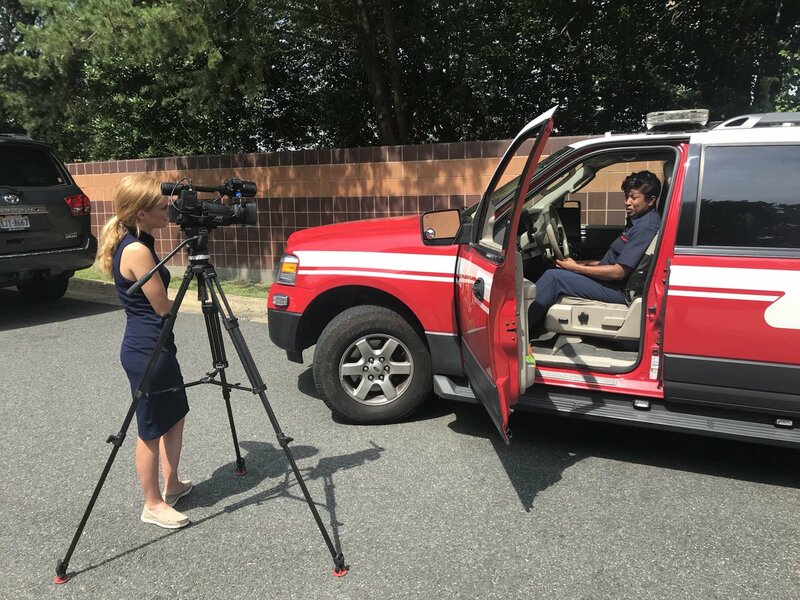 While talking about her story, Chief Wesley encourages those who might be struggling in their careers to keep working, keep improving and they too can succeed. Check out the stories below. On September 6th, 2018, FF/Paramedic Phil Laub, “The Rock,” completed 34 years of service! 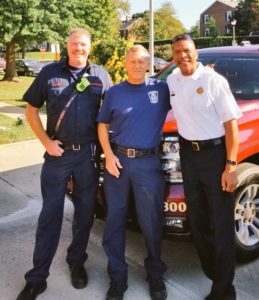 Phil always took care of people whether they were patients, tenured firefighters or brand new rookies. He didn’t complain, he’d just do what he felt needed to be done, often going above and beyond what was required. He’d pull you aside to give you advice, and antagonize anyone who took themselves too seriously with his unmistakable chuckle. Physically, he’s always been a beast, shaming plenty of members half his age with his strength and stamina. He was the quintessential “Old School” guy always simplifying the situation and bring you back to the basics. Until a couple years ago, he’d routinely pull his “Blackberry” (a folded up paper with his hand drawn calendar) out of his pocket to check his schedule and jot down appointments. 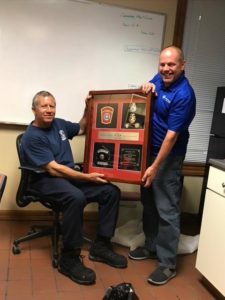 “The Rock” has been a friend and mentor to many in the department and will be sorely missed. Congratulations and enjoy your retirement!